Today, DFID has announced £50 million of new funding to end female genital mutilation (FGM), the largest investment ever made to end FGM worldwide. The funding will support the African-led movement to end FGM and provide better protection for vulnerable girls in some of the world’s poorest countries. BBC Africa visited Sudan where it saw first-hand our projects in action tackling FGM in country. Its coverage includes interviews with women who have pledged to abandon FGM within their communities due to UK aid-supported projects, young girls who have spoken out against FGM due to UK aid-supported projects, members of the Sudanese government, a midwife who used to carry out FGM and imams who preach against FGM. 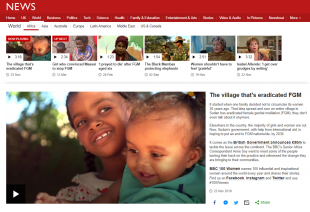 A 3-minute video and a BBC news article online highlights the UK aid projects in Sudan tackling FGM. The video highlights the stories of young girls Zainab and Wahab who will never be victims of FGM after one village in Sudan, a country where the most extreme form of FGM is practiced, has abandoned the practice. It includes additional interviews from women in UK aid-supported community groups in Sudan talking about the impact it has had on their lives and highlights the Saleema campaign, supported by UK aid, which empowers girls to be proud not to be cut, to be ‘Saleema girls’ in Arabic, ‘as God created’. Alongside the BBC’s coverage we have also seen positive stories today across a broad range of UK media outlets including The Nursing Times, The Guardian, The Telegraph, The Independent, Metro, as well as Politics Home. The Telegraph article includes an interview with Malak, a 15 year old girl who saved girls in her village from being cut after raising the alarm, thanks to learning about FGM and girls' rights at a UK aid supported girls club in Gezira State, Sudan. A social media video highlighting the announcement and featuring voices from activists in Sudan and a midwife in the UK was shared on DFID's Twitter and Facebook channels. We have also produced a video featuring young activists from Bristol calling on those around the world to break the silence around FGM in the UK. Additionally, we have published a Medium article telling the stories of activists in Sudan, featuring with photos with quotes from the activists themselves.